One of the things that I've decided to work on this year is a Birthday Card Stamp A Stack series of classes. I will run this similar to my Christmas Card Stamp A Stacks. 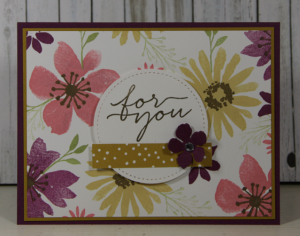 We will stamp 9 cards at each session, 3 of 3 different designs. My first class will be my feminine birthday cards on Tuesday, Jan 24th. Class will be $25 for 9 cards or if you sign up for all three sessions: feminine, masculine and children/teen classes you will receive a $5 discount on each class. Too fun. Here's the first of three card designs for the Feminine class. I've got exactly 45 minutes before Ella gets home on the bus…I think I want to pull out this Balloon Pop Die and see where it takes me! Birthday, birthday birthday! stay warm and safe tonight. Looks to be interesting….